The second of three tapas recipes, and a delicious warm salad that would work just as well on freshly toasted bread. I have a bit of a love affair with char-grilled aubergines - I think it is possibly the nicest way to cook them, and of course it also forms the base of my favourite aubergine dish of all times; Baba Ganoush. This is a little different, as the aubergine is paired with chopped tomatoes and slowly reduced. If you have a gas hob, grill the aubergines over the flames until the flesh is soft and the skin charred. Otherwise, place under a hot grill, turning occasionally until soft. This doesn't give quite the same flavour, but is a decent subsitute. Set aside to cool for 5 minutes or so, then peel off the skin, taking care to remove any black bits. Thinly slice the garlic, toast the cumin and coriander in a dry pan for 30 seconds, then add a drizzle of oil and fry the garlic for a minute. Turn the heat down low then roughly chop the aubergine and add to the pan. 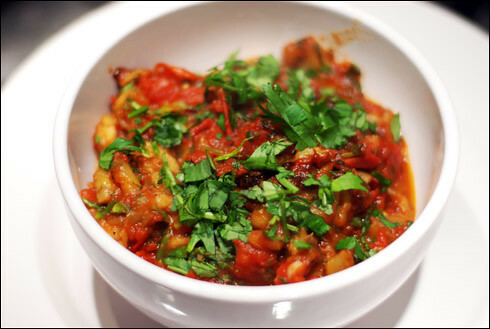 Next, add the chopped tomatoes, paprika, three quarters of the coriander and parsley and lemon juice and stir well. Season to taste with salt and pepper, then simmer down slowly until almost all the liquid is gone. Transfer to a serving bowl and garnish with the remaining coriander and parsley. Serve alongside the Patatas Bravas from the previous entry and any other tapas dishes that take your fancy. This sounds delicious! I honestly think I could eat Baba-Ganoush every day so hope I'll enjoy this one. Yum.